and DAC, and their testing approaches. to determine the cause of error. –GSM, CDMA, 1394, USB2, etc.  DSP (FFT) to eliminate distortion and noise.  Check the fundamental amplitude.  Detect first order defects in a circuit. • Obtain F domain properties mathematically. • Quantization error is sawtooth-like. • Uniform distribute between (-q/2, q/2) (q=LSB). • The error contains a lot of jumps. • Error spectral is much wider than the original signal. wave is quantized by a B-bit ADC. How large is the SNR. input signal to match the full A/D input range.  After the MUX: minimize mismatching among channels.  Can be minimized by placing amplifier before the MUX.  Avoid too many fanins. digitizing oscilloscopes with digital outputs. sources of error, and test methods. • Start from 2% below the transition level. • Take a number of samples. Record Length M and Number of Cycles Mc must not have common term. • There are matrix based and nonmatrix methods. varieties of signals, functions and circuits. 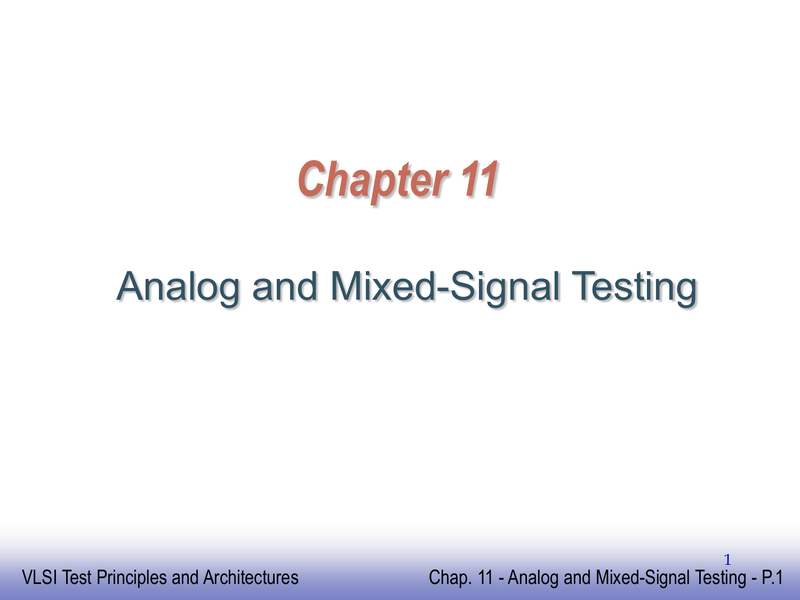 basic analog test items can be accomplished. theoretical background for ADC/DAC testing.